I love them, I loved them, I loved them, I LOVED THEM! Siestas, thank you so much for your powerful prayers for a God-show at the Portland Living Proof Live. We had a whopping 7,300 women (astounding numbers to us from that area of the county) from the beautiful Northwest who hit that place SERIOUS about worship and Bible Study. The Holy Spirit was so thick in Memorial Coliseum at Rose Quarter that I got chill bumps the second I hit that platform. I can’t remember if that particular thing has ever happened before. Honestly, the hair stood straight up on my arms. All the events are memorable and special to me in one way or another but sometimes Christ seems to go out of His way to show Himself present. I think maybe He did it this time to show His great affection to these mighty warriors of the faith who must feel substantially outnumbered at times. They were the kind of group that, when I tried to wrap up the lesson at 9:00 PM on Friday night, they yelled for us to keep going. We’d already been going strong for two solid hours. It was unbelievable. I will never forget them. I LOVED THEM. And, if you were there, Girlfriend, I loved you. One reason we schedule our LPL events to end at noon is so that I can freshen up, change clothes and head on down to the arena where the Rockets then play in that particular city so that I can give Yao a hand. We (Yao and I) did pretty well last night but, now that I’ve fallen so in love with Portland, I don’t want to make a big deal of it. After all, the one huge thing we learned this weekend is that, if Christ is going to be formed in us (Galatians 4:19), we better be crucified to these big, fat egos of ours (Galatians 2:20). That’s why I just wear basic black and white on the court. I don’t want to draw attention to myself. This entry was posted on Sunday, April 19th, 2009 at 8:57 pm	and is filed under Uncategorized. You can follow any responses to this entry through the RSS 2.0 feed. You can leave a response, or trackback from your own site. But God does! Isn’t he really cool? Beth, I had the great pleasure of seeing you in Portland! I knew your name but I confess, I hadn’t read your books (yet) or done the Beth Moore bible study at my church so I wasn’t sure what to expect. I LOVE your spirit! I feel so renewed and revived – God was truly in that place! I’m so grateful for my revived spirit. And now I KNOW that JESUS CHRIST has formed into my body – fingertip to fingertip! I am so thankful to him! God Bless you! This is just too hilarious! This is the first time blogging for me so I hope I get this right. I just wanted to write and say I was one of the gals in Portland. It was a five hour drive to Portland with a two hour wait in the hotel lobby to check in and then another forty five minutes in line to the event then another hour and a half for it to start and ohhh was it worth it. This was my first living Proof Live Event. I was so blessed. I felt led to go alone this time but I think I will definetly take a friend next time. I just wanted to tell you Beth that you have made such a big difference in my life and you have taught me so much. Thank You. At one point at the conference you leaned across me to ask a lady her six words and I wanted to jump up and say hi Beth you mean so much to me and throw my arms around you but I was afraid that I would be thrown to the ground and led out by security lol. Again thank you. PORTLAND LOVES YOU TOOâ€”VERY MUCH! Living Proof Live has truly changed the direction of my life. Do you remember me? I was the very ill woman you prayed for whose six life descriptors were â€œI am dying, take me homeâ€ and yet after receiving the nourishment and medicine of Friday nightâ€™s service, the Lord transformed me so much so that my lifeâ€™s words are now â€œI am yours, take me anywhere.â€ I feel so restored, replenished and healed that I donâ€™t even feel the need to go back to my Cardiologist because the ultimate Physician of all has healed me; I just know it Beth–Praise God. Thank you. From my family, my friends and most especially my three sons Gabriel, Samuel and Elijahâ€”thank you for your prayers, thank you for your compassion, thank you for your courage, thank you for your obedience to God, thank you for your faith through an exceptional life whose ego is daily crucified so that Christ can be continually formed in you and through you to minister resurrection to the lives of hundreds and thousands who have been and will be healed from the suffocating chains of repression and rebellion to the everlasting freedom of Christâ€™s reformation. I will see you in Heaven, girlfriend, joining you with the ultimate praise team of angels but— be reassured precious sister— that after your intercession-I am not going anywhere until the Lord himself– takes me there. This is just too funny – I was actually buying into it for just a little bit! Glad that God showed up big time in Portland! Oh Beth, we laughed, we cried and oh boy did we worship our Jesus together. Hisfivefooter and I are still riding the high from the weekend in Portland!! There really is “No High Like The Most High”!!!! The Holy Spirit did DROP in that place in a MIGHTY way from the moment worship began. Friday night I just sobbed all through worship and kept telling the Father I didn’t want this mountain-top time to end. Oh, just to be in HIS presence, my we got a taste of heaven didn’t we!! Lisa and I were like high school girls again and we got one of the band guys to pass Travis a note that we were there and said hi. He’s such a sweetie, he made sure and came out and found us to give us a hug and say hello. Jesus and Me, we’re the majority!! I pray I never forget the word that you brought us……crucify it!! Until CHRIST is formed in you!! Amen and Amen. Big Hug on you neck ((((()))))!! Thank you, Beth for following the Spirit’s lead to Portland….I was SO BLESSED by you this weekend!!! It was the thrill of a lifetime to join my voice with the 7,200+ others in worship of our mighty Savior. Heaven is just gonna be a blast, I tell you! My six words were: “PRONE TO WANDER — CHAINED TO GRACE”. This, honestly, should be a bumper sticker stuck to my forehead. I had a few others, but this one pretty much sums it all up for me. I absolutely loved what you had us do at the end – speaking God’s amazing words of Truth over each other…..I wish we had a copy of what we said to tape to my bathroom mirror. Thanks for serving the Lord and for doing it so transparently. 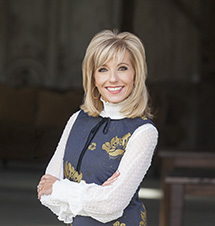 You rock, Beth Moore – because you’re standing on THE ROCK!!!! Oh, and by the way – you’re darling, too! I read this blog about Portland and had tears come immediately to my eyes. I was there and want you to know that I was blessed beyond measure with your wonderful teaching, Travis and the worship team and all of the “church” ladies ~ It was an overwhelming and spiritually blessed experience and I am praying that you come back SOON! (I had to miss Friday evening due to illness, but I felt as though God didn’t let me miss a beat!) Blessings to you, my beloved teacher and thanks for your humility and love for all of us Siestas. One of my favorite blog entries ever. Ever. Thanks for brightening up my Monday! Freaking Hilarous! You go girl! The Lord led the way for me to attend Portland. I normally do not go to anything away from home, my health is so bad. I was so God filled this weekend. Pain was not a factor. I came away from Portland renewed in Jesus. Realizing for the first time just how much my EGO gets into the way of modeling the very one I love the most…JESUS. I also came away from Portland believing that Beth Moore is a good friend of mine. My heart, soul and mind were so touched! I just moved to Florence, Oregon and when I heard you were going to be in Portland I was so sorry that it was too late to attend! It was a beautiful weekend here, I hope you were able to enjoy some of the outdoors! Thanks for the pictures, I love this kind of humor! I laughed so hard!! When I need a good laugh I’ll visit this entry again!! Appreciate you all so much!! I love it! This post is priceless! Siesta Beth, Are you a southpaw? 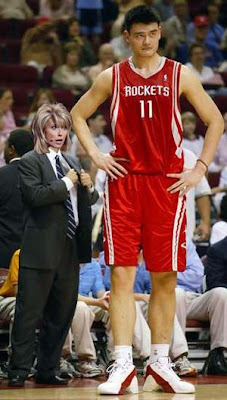 And was that a hook shot you were making or was that the long ball to Yao Ming? I can now see how the Rockets are dominating their opponents!! !Let’s hope it’s Houston vs. Orlando in the championship game! Question:It’s obvious that you have knowledge of the game. If truth be known…Did You give Melissa basketball tips when she was a player or did she give them to you? Beth, I was there in Portland and it was amazing!!!!! I’m glad to know that others get the “God tingle” too…I thought I was strange! You are an amazing woman and we are so blessed for your commitment to the faith. God is using you mightily for sure!!! I am wondering if there’s any way for you to post on your blog the final prayer you had us share with a woman next to us. It was powerful and I’d love to continue to pray it! Big hugs to you sister! Beth, I was there and have to share this with you….I could have used the ‘EGO’ message prior to packing for our trip from Bend to see you in Portland. I only packed CUTE shoes and now am suffering from tendonitis due to all the walking in those cute shoes:) I’m a young thing that is fairly fit and have no other excuse for tendonitis in my left ankle then cute shoes, Beth Moore event and SHOPPING:)!! It was life transforming and now God has me at full attention with my leg up! God Bless you! And we love you, we love you, we LOVE YOU! This is just about the funniest thing I have seen – laughter for the soul! Ahh, Beth, it was amazing! I flew from OKC, OK to Portland to see you with an 18 year old that I homeschool. We had been planning the trip since we saw you at the Siesta Fiesta. I don’t know if I have ever seen something like that in Portland! I grew up there as one of just a few Christ followers in my school. It was so powerful to feel God so overwhelmingly in that building! Though San Antonio was wonderful teaching, I truly feel that the main reason I went to San Antonio was to get to Portland. Life Altering! We laughed, we cried, and we saw life views changed…all in six words! Like others have said before me, I am so glad that my six words when I went in were not the same coming out. Thank you so much for letting God use you! i was there in Portland, and still trying to process everything. Thank you so much for everything. As I sit here trying to type this through the tears that just stream down, thank you. that does not just seem like enough. I can not explain everything here, but I am being led to write this letter to you that explains everything. All I can say is please come back to Portland!!! Thank you SOOOO much for loving Portland! I was praying my heart out for you and the ladies. I am from Oregon, and God has relocated me to a different state but part of my heart is still there! I was beside myself when I heard you were going and I just knew that God would open up the Heavens over you all. Thank you again for sharing your love and knowledge of the Lord and his word with my homegirls! Last weekend was my first time hearing you speak LIVE. You and your team are so on fire for the LORD. He spoke to me in a BIG way and I came back to my three girls (5,3, and 1) refreshed. I’ve been struggling with this job of mommy/wife/friend etc. I’ve been striving for perfection – but I now know, that’s not what God wants out of me. Thank you for coming to Portland. I am a regular siesta… and part of the Siesta Scripture Memory Team with determination to visit Houston in January! I was joined by my sister who flew in specifically for the event from Maryland… and 40+ women from my church, Portland Christian Center. We live in Portland, but had a mini-retreat at a hotel just a 1/2 mile from the Coliseum that I coordinated. My sister visited me in January during a very difficult time in her life and decided to fly back out to experience the event together. She is currently doing Psalms of the Ascent and Breaking Free with a mentor. Your continued prayers for her would be treasured. My current memory verse? Galatians 6:9… you touched on it briefly in Portland… isn’t that just a God thing? I was at the Portland event and it was truly magical. You have touched my heart deeply for God. Thank you for taking the time to come and worship with us. You are so funny!!!! You and Yao are now the background on my computer each time I start working on it. I’ll have a laugh each time I start it. So glad that you visited my hometown! I miss it so much, but I’m glad you had an event there…that place needs it and I know the women there appreciated it! that has got to be one of the funniest things I have seen in a while. Such creativity!!! Thanks for making a lot of people smile really big! love you and praying for you! Thanks so much for the updates of Beth’s traveling/speaking and the opportunity to pray. I would so appreciate reminders just prior to LPL events so we can pray even more fervently those days. (I know we can find the schedule, but for some reason the prayer request from the individual–or daughter, in this case–keeps with me longer) I thought about you all so many times over the weekend. Beth, thanks for continuing to run faithfully with our LORD while causing us stitches in our sides along the way!!! You, my friend are too funny. Love the pic. The message sounds amazing, too. I thought I saw you at Mens Wearhouse! Thank you so much for coming to Portland!! I loved seeing you in person after doing so many of your Bible studies with videos. Your message was powerful and I loved every minute of it!! Beth, we (Portland) love you back, THANK YOU for coming!!!!! All I want to know is…When are you coming back? 🙂 The Lord is mighty and AWESOME and amazing!! I am still “chewing” on the things He gave me over the weekend. Thank you for doing what you do! Beth~ I’m at a loss for words to describe how I felt at this conference in Portland. THANK YOU so much for all of your insights. We love you back, girlfriend! -Kathy in Bonney Lake, Wash. Walk with Me…none else matters. I’m blessed to know that you loved Portland Spiritual Mom Beth!!! That is very exciting that the Holy Spirit was that present with you all. They were hungry for God, for His Word. Your pics are hilarious! Making me laugh, Spiritual Mom Beth! Amen. We absolutely need to stop being delusional about ourselves. There’s no “I” in BODY. Help us, Lord, we need lots of help! I have already written one comment on this page (I am hoping that they will add this one too), but I didn’t realize that a person could put more than just a few words down…I have had it on my heart to let you know that when you were in Portland, you had said on Saturday morning that you had read our letters that were sent and that you knew that we had some pretty incredible testimonies…I was so blown away at that moment, because I had written a very long letter to you a couple of months before you came to Oregon with my story and to know that you actually read it means so much to me. I didn’t write my letter to boast or put myself “above” anyone else, but I did write it to testify what our LORD has done in my life and to magnify His Holy Name. THANK YOU for being who you are and for loving US so very much. Your love for our LORD and your faithfulness to Him are an absolute blessing to so many of us and I am personally thankful that you listened to His calling for you to minister to women. Because of you, I have been able to grasp onto the Word more and it makes sense to me in ways that it didn’t before…you pull it all together from the Old Testament to the New and you to it with such grace. My two best friends and I went together. It was an amazing time. We were so emotionally empty and y’all filled us right up! Thank you, thank you! Make the King the thing! I have tears streaming. I moved to Texas from Portland a few months back, concerned for all the precious ones I left behind at my office and in my neighborhood that had yet to accept Christ. The first time Beth came to Portland, there was such a small turnout. To hear 7500 attended this time…wow! I’m thinking God is setting out to answer this girl’s prayers….who knows who got saved and will be talking to some of the ones I’m praying for?